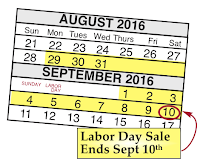 Woodstock Soapstone Co. Blog: Labor Day Sale! It is almost Labor Day, and we are busy getting our barbeques ready to fire up. However, it won’t be long now, and we will be firing up our woodstoves. The autumn air brings a chill in the morning, and in the evening; a chill that our Woodstock Soapstone woodstoves can easily dispel. Get a jump on the crispy fall mornings, and the chilly fall evenings that are just around the corner. Jack Frost will be here very soon. Every woodstove we make is on sale. Take advantage of the huge discounts we are offering right now! Saturday, 9:00 to 5:00 Eastern time.